Published March 24, 2019 at 7:56 p.m. Assembly could be befuddling or it could be boring – but no assembly has even been remotely like the one recently held at Highland Community School – an MPS-chartered Montessori school – a chat about fundraising, good behavior and leadership that eventually evolved into a visit from a glowing sentient quadrilateral, a man in a long tie speaking in unintelligible squawks and, of course, a bear attack. 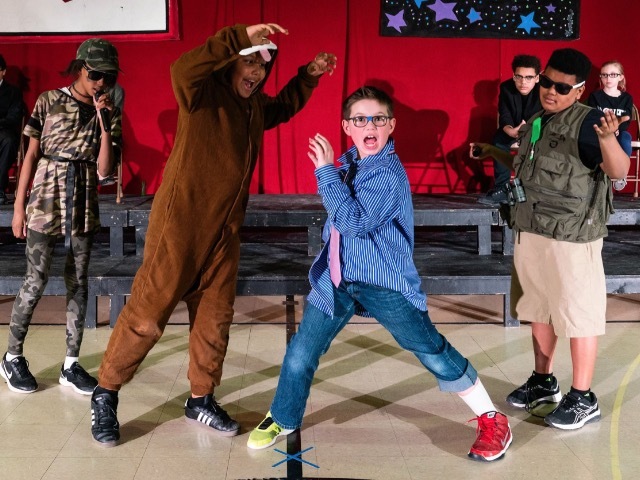 Indeed, this was no regular assembly; this was "Assembly," the latest jubilantly bizarre, surreally silly play created by Highland performing arts director Barry Weber and his cast and crew of wildly talented, creative grade school students. The original show, performed twice last week in the Highland gymnasium, 1706 W. Highland Ave., to eager crowds of students and parents, doesn't sound all that odd on paper – especially considering its recent history of productions inspired by cult indie director Jim Jarmusch, '80s choose-your-own-adventure RPG fantasy stories and, most famously, David Lynch. And then the show actually begins, a cavalcade of weird inspirational speakers and overly enthusiastic promotions that continually slide into surrealism. It's enough to make you question your commitment to Sparkle Motion – especially as students one by one are called from the crowd into the office, never to be seen or heard from again, save for one student boldly breaking in every 15 minutes to question why he's in trouble for something he didn't do, in a class he wasn't in, on a day the school wasn't even open. It's nonsense, but meaningful nonsense, with apparent inspirations found in Kafka, "Brazil" and perhaps an incidental splash of today's headlines. But the real spark, according to Weber, came from star stand-up comedian John Mulaney. "When he came to The Pabst, he did a little bit on how he remembers not only the assembly at school, but the assembly after the assembly where they yelled at the kids for how they acted at the last assembly," Weber recalled. "I remember a lot of those – but I also specifically remember where, in middle school, they'd have a full class meeting, hands on hips, saying, 'We're going to talk about what happened!' And I remember being at some of those going, 'So what happened? What are you talking about?' There was something there I thought to play with and experiment with, this idea of an assembly where you all know what happened except you're never told." His other inspiration for "Assembly" came from a source far less goofy than Mulaney, but far closer to home: Dr. Maria Montessori, the famed educator whose philosophies inspired schools like Highland Community. "She did several lectures after the fall of fascism in World War II and talked about what made this happen, what makes people grow up wanting war and dictatorships," Weber explained. "Some argued we glorify war too much, and she said possibly. But what really happens is that, from a very young age, children are taught to obey a dominant, singular, autocratic authority figure that you completely obey without question. And maybe the teacher is nice and sweet, but that's a benevolent dictator." If that all sounds awfully heavy for a school production, you wouldn't know it from watching "Assembly." The enthusiastically performed show throws bright, goofy gags at the audience at all times, from the aforementioned glowing quadrilateral to reminders to sell as much jalapeno creamed corn cookies as one can and an informational video explaining that two plus two does, in fact, equal five. There's a mild, purposeful feeling of quiet menace that emanates from the story, a pesky feeling that not everything is all right despite the Big Brother teacher characters insisting that you "follow directions and you will be fine." It's fascism disguised by a mask of decency, kept in place by enforced "good behavior." But then there's also a man who walks proudly on stage and balks like a chicken. From the cartoonish to the creepy, there was enough to thrill and entertain both the kids in the crowd and their parents – a rarity for grade school shows, most famous for being anodyne. Weber admits that was partly his goal, creating "a kids play for adults" – one that, from "Assembly" to his earlier adult-skewed shows, appears to have worked. "The first play I saw was 'Judy Plays with Fire,' which I was told was inspired by 'Twin Peaks.' It kind of floored me. I was like, 'You can do that here? That sounds great!'" said Stevie Weishan, who came to Highland five years ago and now helps with the shows, complete with a daughter in this production. "This is the kind of work I want to do with kids: doing fun and interesting things, and getting to know them." Despite their source material, and bigger themes, however, shows like "Assembly" are most definitely not just for the adults in the crowd and working behind the scenes. 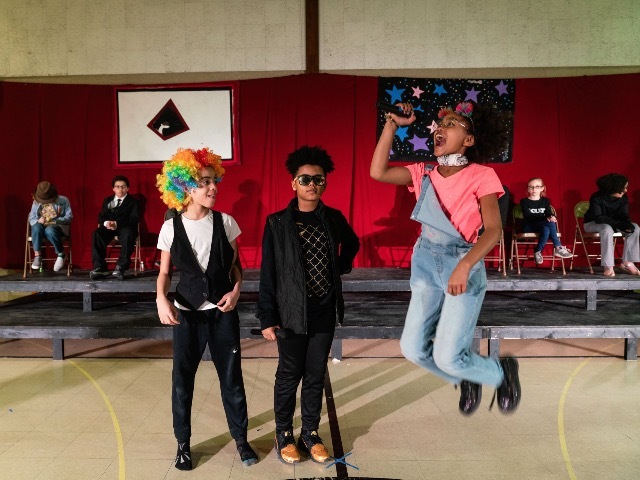 They're still, at their heart, fully and deeply for the kids: to explore performing, to explore putting themselves on a stage, to explore teaming together to make something, and to explore weird or complicated ideas that a typical classroom can't teach. "I was so proud because all these weird flags and things like that, that was just something the kids got so into, this idea of making it strange and full of jargon and weirdness," Weber said. "What I really love is that we've reached that point where the kids are pretty much doing everything. The whole goal has been to give them these tools and set them up so they can do it themselves. I feel like I didn't do anything the morning of the show." "Sometimes you worry, 'Are they gonna get it?' But as soon as they started making the weird art, it was almost like, 'Wow that's almost too much,'" laughed Jess Hoffman, a parent and volunteer with the kids designing the show. "They understand, if not directly the symbolism, the tone of what's going on. It comes out in their props and their work. They take it to where they're primed to go, in a safe space, in a school where they know Barry, Stevie and myself are there to support it." It's a strategy that's worked thus far. "Assembly" marks the largest cast and crew of any show under Weber's watch – once again featuring no silent tree roles, as every performer has a line of dialogue and even the ushers are integrated into the design and production aspects of the play. Many of the students are returning devotees to Highland's theater program, on their third or fourth production, but many are also new, joining on after seeing what oddball fun times they create on stage. Talking to a group of the young actors after their performance for their fellow classmates, Siri Reinbold, Skye Posey and Jordan Davis couldn't stop talking over one another, eagerly explaining why they come back to the show every year, and how it's exciting and original and unlike anything other schools are doing, thanks to how much the advisors and teachers allow them to participate in its creation and development. One even notes she'd like to keep pursuing acting as a career. It's clear that, while "Mr. Barry" (as the students call him) may write the script, the real vision and passion fueling a show like "Assembly" comes from the kids. Those in the crowd respond in kind. 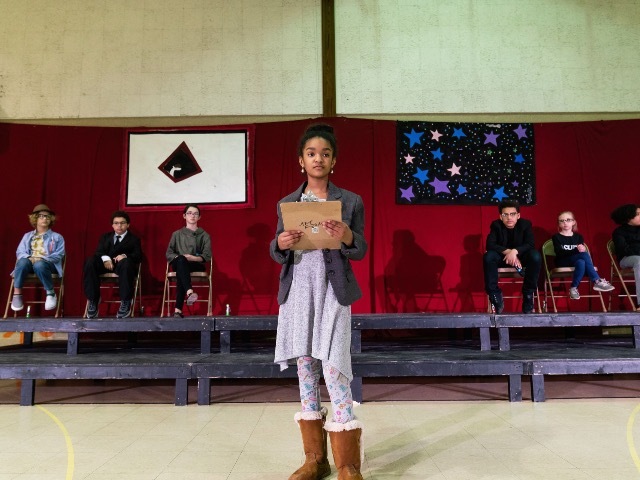 During the show for their fellow classmates, the excitement and atmosphere was similar to a rally, with kids laughing at the right jokes, participating with the interactive elements and overall engaging with the show – far more than one would see in yet another rendition of "Our Town" or "Wizard of Oz." "I think it's harder for adults to go to that space and admit this is what's happening or at least what it feels like, whereas kids slide right into it and they react and respond," Hoffman said. "It's not like they're sitting down having these hour-long conversations, but I guarantee in their own way, those conversations are happening." Reactions like those – from kids and adults alike – help answer the biggest question "Assembly" raises: How does Weber get away with making these crazy original shows? Especially with this one, which introduces a lot of challenging, anti-authoritarian ideas about schools, institutions and teachers … right in the middle of a school show. "There's nothing in this show that's meant to be a response to any singular thing, but it's good, whatever art we do, to hold our own feet to the fire," Weber said. "One hundred years of the factory model school system, how we grew up and how we think schools should be run can run deep. I myself probably have bad habits that I've picked up; that runs deep. "So how do we get away with it? My hope is that, because our school considers itself an open-minded place, people who come to see the show will approach it from the perspective of reflection. "And if nothing else, they'll go, 'Ha, at least this isn't our school."